In today's world of multitasking, achieving goals and moving onto the next job without a second thought plus trying to do everything and anything in between living your life, it can sometimes feel as though we’re always on the go and are surrounded by people who are sailing past us in life without a care in the world, or competing for the same attention and business that we also want to attract to make our little ventures succeed in a crowded market. And with that can come a lot of negative self talk, comparisonitis (I talk about this in this post) and feeling as thought we’ll never catch up with everyone else around us. In fact we’re trailing behind in such a sorry fashion that the thought “can I even call myself a *insert noun here*?” enters your mind on a regular basis. But there is a way to keep going especially when it can seem like you're floundering in others shadows, and that’s by bringing out the best weapon you will ever have in life… you. Being your biggest supporter in whatever you do will be the best thing you can and will do for yourself. It seems so easy to talk ourselves down in order to maintain a level of modesty and grounded-ness especially when we’re talking about building and developing a business, but what does this actually achieve? It certainly doesn’t help with building up a personal reserve of positive mental energy to keep ourselves ploughing on even when all seems lost and futile. Instead of looking for support from others around you, think about who you spend all of your time with, and treat that person kindly, listen to what you’re telling yourself and think about how you describe yourself to others. No more “I’m not good enough,” or “I always mess things up,” and more of “I can do this,” and “I am good enough!” In fact, in the words of Tina Turner, you are simply the best. 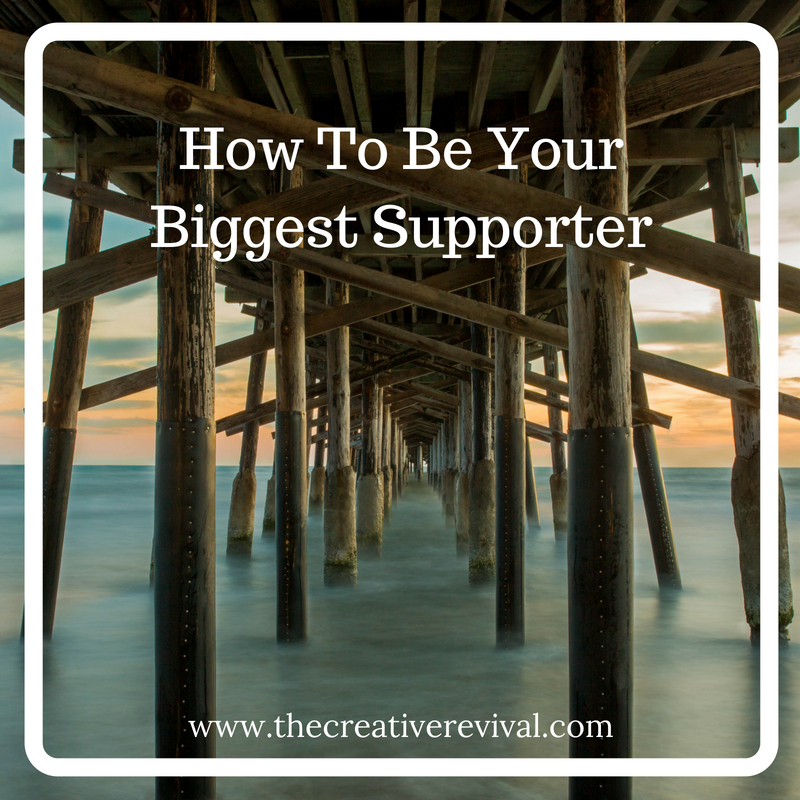 So here are 5 ways in which to start supporting yourself and shine a great big light on the biggest supporter you’ll ever have in life. Have you ever been in a situation where you feel prickles on your neck, a tingle in your spine and an uneasy churning in your stomach? No I’m not talking about being in a haunted house. Although this does apply to this situation too. Have you ever had the thoughts “do not do this!” and “don’t trust this person! !” screaming so loudly in your ears that you’re surprised that the other person can’t hear them. Trust yourself, and all of your bodily sensations, enough to know whether whatever opportunity or situation you’re standing on front may not be the best thing for you at the time. (This goes against the saying say yes and think about it later as this particular situation will leave you feeling excited and like a handful of butterflies has descended into your stomach). The moments I’m referring to are those when every inch of your being is telling you not to go ahead with whatever/ whomever is standing before you. Saying no doesn’t reflect on you in a negative light; rather I strongly believe this to be a strong character trait in which you trust yourself so much that you will by-pass an opportunity that doesn’t resonate with where you are the time in your life. This links into the above point; you’ve collated a mass of experiences in life and learnt so many lessons… why not use these to support yourself? I’m a strong believer in seeing any experience in a positive light, no matter how awful it seemed at the time. Oddly, some of the toughest life experiences garner a wealth of lessons and build up aspects of your personality that may have been hidden from view beforehand. It may not seem like it at the time but those times can be the more valuable in terms of working exactly who you are and what you are capable of doing. The situation doesn't have to be exactly the same as the last time you went through it, but there will usually be a feeling/ sense of déjà vu which will flood your mind with “I think I know how this will end.” So use those experiences to your own advantage, think about how you can use the lessons learnt and apply them to the current situation. And instead of deferring responsibility onto someone else, take control and support yourself in the situation. And you know what? This will add to your bank of lessons and experiences that you already have that you can always use at a later date. Bonus! We usually need support around us when we’re moving out of our comfort zones and reaching for something new in life. Plans have been identified, goals listed down and actionable steps have been deliberated over… now it’s time to do it. And instead of looking to someone else to hold your hand and guide you along the way (although this does help, especially when that person is sufficiently removed to remain objective but supportive… shameless plug for my coaching packages here, as well as seeing my experience of being on the other side of coaching), hold your own hand and take the steps to make a difference to your plans. Small steps are more achievable than big giant leaps especially when each step is taking you further and further away from your comfort zone. Know what you want to achieve and keep this in sight as you move onwards and upwards. Treat yourself, splash out on doing things you like and enjoy your own company. Remember, you’ll be with you for the rest of your life so it’s better to enjoy your own company. There’s a saying I’ve heard a few times alluding to how someone could never enjoy himself as he was always there. A clever play on words (I’ve probably mashed it all together but I hope you get the gist of it) but what a terrible state of play if you can’t even enjoy your own company! Spending time with yourself and reconnecting with who you are rather than the persona you may usually mask yourself with is a worthwhile investment in both time and effort. Like who you are and what you want in life, what you want to achieve and acknowledge the struggles you’ve overcome so far. Give yourself a pat on the back (metaphorically, unless you’re double jointed or are extremely flexible) and give yourself time each day to just be you. As mentioned in the free e-book on 5 Effective Steps to Challenging Fear Based Thoughts think about the language you use about yourself that screams volumes to other people. For instance, I watched the stand-up gig of a well known comedian who I thought was fairly comical and humorous. But as the show went on and she delved into her childhood and lamented on how previous experiences had impacted upon her in later life, I suddenly started to feel uncomfortable and un-able to continue watching the show. She hadn’t done anything wrong in all truthfulness; rather I’d started to notice the words in which she described herself (frumpy, bullied… more negative than positive) and rather than being funny, I found it to be rather depressing and self wounding after a while. Imagine what she must go through on her own if these were the words she used in public! Now I get that comedians chose words and timing perfectly to add the comedic factor to their shows, and maybe her choice of words were scripted to within in inch of their lives to make the anecdote that little more enticing to the listener, but I didn’t connect with it after a while. And it just left me feeling slightly deflated myself. So by being more aware of the words you use about yourself, this can really start to change the way you see & present yourself, not necessarily to others (I mean, we are talking about being your own supporter here! ), but to yourself. More positive and less negative please! It really does help. It goes without saying that one of the best things you can do to help yourself is to help others. I get that this sounds like an oxymoron in that it’s the opposite of helping yourself, but consider the last time you helped someone else with an issue of their own and how it made you feel afterwards. I’m guessing happy, contented with a sprinkle of a smile on your face for a while afterwards. Even just seeing their reaction and gratitude that someone was taking the time to be there for them at their time of need was probably enough for you to know that you were doing the right thing. And the more you put yourself out there for others, without the expectation of reward or one-up-man-ship, the more you feel at ease with yourself, with the added bonus of taking time away from your own situation which allows other thoughts to seep through and clear a pathway for your own dilemma. This process is more commonly associated with gratitude and being grateful for what you have and are, rather than seeking validation through possessions and other people’s opinions. However you choose to help others, do it in a way that will mean something to the other person rather than focussing solely on what benefit you can get in return. Being your biggest supporter in whatever you do will undoubtedly help you to move forward towards whatever goals and achievements you have in view. By making a few small changes to how you view, talk and present yourself, you’ll soon find that the biggest supporter you’ll ever have in life has been with you all this time.